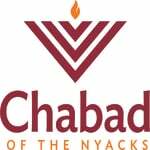 Close to 200 people joined together last night at the new JCC campus for A Tribute to the Rebbe organized by the Chabad Centers of Rockland County. 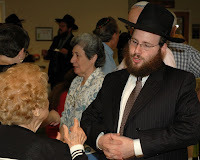 Rabbi Avremel Kotlarsky, Regional Director of Chabad of Rockland, began the program with warm opening remarks and acknowledged the distinguished dignitaries that were present. Rabbi Chaim Zvi Ehrenreich, director of the Chabad JEC of Chestnut Ridge, read Chapter 20 of Tehilim for the safety and protection of our brethren in Eretz Yisroel. 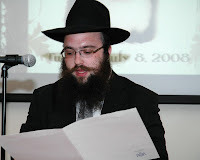 Rabbi Shmuel Zanvel Gancz, director of the Chabad Jewish Center of Suffern, read the letter that Congressman Elliot Engel sent in honor of the event. Rabbi Yisroel Goldberg, director of Community Outreach at Chabad of Rockland, read the proclamation that Assemblyman Ken Zebrowsky sent on of behalf of the New York State Senate in honor of the Rebbe. 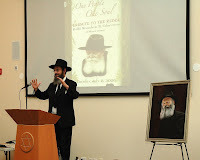 A short biographical film on the Rebbe’s life was shown as well as the film Challenge to which the audience reacted to tremendously. The highlight of the evening was the inspiring talk that was delivered by Rabbi Mendel Kaplan, of Chabad of Thornhill, Ontario. 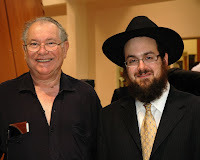 Rabbi Kaplan, was able to relate the Rebbe’s way of dealing with the global challenges of today. Everyone was treated to a delicious buffet dessert. To conclude the evening, Rabbi Naftali Marrus, sang Sheyibone Bais Hamikdosh, the song with which the Rebbe would often times conclude his farbrengens.